Home > Reducing the Risk > Where do Collisions Occur? It's important in real estate and equally important in predicting locations which have high risk factors for wildlife vehicle collisions. The analysis of many wildlife kill sites in Canada's National Mountain Parks indicated that the physical characteristics of the highway and the adjacent corridor were good predictors of locations with high numbers of wildife-vehicle collisions. The first three factors are self evident. The availability of forage and water close to the road is likely to increase the presence of animals. The fourth factor is more troublesome. One assumption is that when there are good road conditions - long, wide and straight - motorists tend to feel safer and more confident, and therefore accelerate. This increase in speed reduces the reaction time of the driver when an animal is seen on the road. The British Columbia Ministry of Transportion and Infrastructure (MoT) administers the Wildlife Accident Reporting System (WARS). The WARS system is designed to analyze wildlife accident data collected by MoT Maintenance Contractors on numbered highways in BC. This data is the best source of information on wildlife vehicle collision locations in BC, and is becoming a model for other jurisdictions seeking to record and monitor wildlife vehicle collisions. Sielecki, L., 2010, Wildlife Accident Monitoring and Mitigation in British Columbia, WARS 1988-2007, Special Annual Report, British Columbia Ministry of Transportation and Infrastructure, Engineering Branch, Environmental Management Section, British Columbia, Canada. Page 6-4. 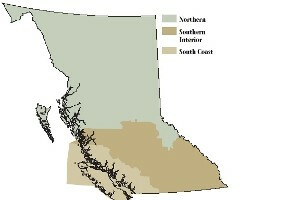 South Coast Region - includes Vancouver Island and the southern coast of B.C. Southern Interior Region - located between the Rocky Mountains and the Coast Mountains, including the Kootenays, the Okanagan, the Thompson-Nicola, and the Cariboo-Chilcotin west to Bella Coola. Northern Region - extends from approximately the middle of BC, west to Prince Rupert, east to the Alberta border, and north to the Yukon border. The Southern Interior Region has approximately 55% of all the wildlife vehicle collisions in B.C. This is due to the high number of collisions that occur in the Kootenay area of the province. More detailed information on wildlife-related motor vehicle collision factors; cost of wildlife-related motor vehicle accidents; common wildlife collision mitigation methods used by BC MoTI; and provincial, regional and district collision statistics can be found in the WARS reports. The risk of having a collision with wildlife is not restricted to rural roads or highways. Wildlife is present in urban settings as well. Bear are a problem in many municipalities in September and October. When food supplies become scarce at higher elevations, bear move lower down into the valley bottoms where food may be more readily available. It is a severe problem in some areas. some municipalities have challenges all year. deer warning signs posted in their downtown area. Of course, smaller animals, such as racoons, porcupines, skunks, rabbits, squirrels, etc., are also present, sometimes in large numbers, in urban settings. Drivers need to be cautious on roads that connect outlying sections of a city with the more populated downtown areas. These roads may pass through less developed areas, which provide habitat for wildlife species.